Our team creates a range of quick, easy and delicious meat dishes ready for the oven or bbq. Our butcher Clayton, was awarded 1st, 2nd and 3rd prize in Tasmania for three pork dishes he entered into the 2016 Pork Butcher Innovation Challenge. Vermey’s Quality Meats are committed to supplying Hobart, quality Tasmanian meat that is free range and has no added hormones, steroids or growth promotants. We also stock a variety of hard to come by products, game and high quality mainland speciality products. Our selection includes free range for life pork from small local producers as well as Scottsdale pork (bred free range), Cape Grim Beef, Robbins Island Wagyu, a variety of game (including rabbit, quail, duck, venison and wallaby), free range grass fed Tasmanian beef and lamb, and sustainably produced & RSPCA approved Nichols Poultry. We offer superior service and personalised cuts of meat. It is your choice how you would like your meat cut. There is no need to settle for what is in a pack, just let us know the quantity or weight you need. We are always happy to trim, slice, dice and tie meat to your specifications. We have a wide range of gluten free products and can make preservative free sausages or cater to your specific dietary requirements. We can also source Halal meats. For quality meat cut the way you like, helpful cooking advice and friendly staff, come and see us at Vermey’s Quality Meats. Marcus Vermey and his team of experienced butchers work hard to ensure that all the meat is of the highest standard so that you receive consistently tender, juicy and tasty meat. All stock is personally approved on arrival. If we are not happy with the quality of the meat, we will not sell it. We are committed to supplying our customers, wherever possible Tasmanian meat that is free range and has no added hormones, steroids or growth promotants. We have a strong reputation in supplying quality meat and believe in product integrity. You know exactly what you are getting. We will not sell you old cow for yearling beef, small beef as veal, or mutton dressed as lamb. Marcus Vermey is a third generation butcher. Marcus’ father Bill together with his grandfather Bill Snr established Vermey’s Quality Meats in Sandy Bay in 1964. Marcus has proven himself to be a top quality butcher not only in Hobart but in Australia, by winning the Australian Work Skills Competition in 1992-93 and participating in an Australian Meat and Livestock Corporation exchange to Japan in 1995. Marcus is the Tasmanian Chairman for the Australian Meat Industry Council and is on the committee for the National Australian Meat Industry Council. Marcus commenced running Vermey’s Quality Meats in 1997. He places great emphasis on giving his customers a high level of service. 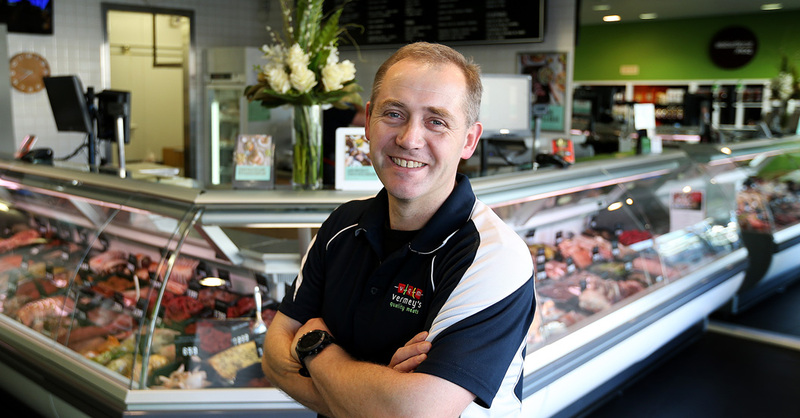 Vermey’s Quality Meats were a finalist in the 2015 Hobart City Council Awards for Exceptional Customer Service (Retail/Hospitality Small Business Excellence). Vermey’s Quality Meats is a local business which believes in supporting local farmers and supporting our local community. Marcus helps teach classes at the Agrarian Kitchen, including a course called The Whole Hog which utilises all cuts of pork from nose to tail. Rodney Dunn in his book ‘the agrarian kitchen’ described Marcus Vermey as ‘..my go-to man for all things meat.’ (page 267 Acknowledgments, ‘the agrarian kitchen by Rodney Dunn published by Penguin. Marcus Vermey helps teach master classes at the Agrarian Kitchen. Marcus has three boys. At this stage it is uncertain whether there will be a fourth generation of Vermey butchers.